Happy Birthday to Maraudin' Iron Pyrite Mike! Like I said afore, how very appropriate that this seemingly normal man was born on April 1, also known as April Fool's Day. 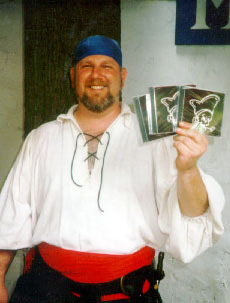 An even better indication of Mike's inherent foolishness is the fact that he has worked for us FOR FREE, peddling our CDs and tapes at the Maryland Renaissance Festival and a lot of other gigs. We should be grateful for such selfless work and dedication, but we're rude and horrible people. Plus, we hear he suddenly wised up and decided to work for actual money at the White Hart during this year's fest. So, thanks for nothing, Mike! Oh, I was just kidding. Here, have this lovely bottle of yummy, aged (like you!) single-malt scotch. No wait, don't guzzle it yet! We're going to sing the birthday song for you and you'll drink everytime we sing "you." Ready? Well, hell, if you're not going to drink it, you may as well share it... how about a nip offa that bottle, old chum?